Steve Bunnell is a partner in O’Melveny & Myers LLP’s Washington, D.C. office. Chair of O’Melveny’s Data Security and Privacy Practice, Steve is a former General Counsel of the US Department of Homeland Security (DHS) and a former Chief of the Criminal Division at the US Attorney’s Office in Washington, DC. Steve’s practice spans many of the most pressing issues facing businesses today, including cybersecurity and privacy, criminal antitrust, healthcare fraud, money laundering and financial institutions fraud, securities fraud, Foreign Corrupt Practices Act, and False Claims Act matters. 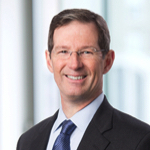 As the chief legal officer for DHS from 2013 to January 2017, Steve advised senior Department leaders on a wide range of significant legal, policy, and operational issues, including cybersecurity, data privacy, CFIUS, SAFETY Act protection, aviation security, immigration and border security, customs enforcement, government procurement, and the protection of critical infrastructure.